These days, more and more people are accessing the web using their cell phone or other mobile device. Web-capable phones include Google Android devices, iPhones, Blackberry devices and even Nokia phones. These devices tend to have a very small screen so, while most web pages will render on these devices, the pages will often be unreadable because the screens need to be greatly reduced to fit into the browser window. The user may be able to expand the font size, etc. to improve readability but this means that only a small portion of the screen can be viewed at any one time so the user must continually scroll the screen to see the entire screen’s content. A better solution is to adapt the content of your web pages to cater to the smaller screen size of mobile devices. This way, the user experience is greatly improved because they can easily read the pages without resizing the screen and with minimal scrolling. By giving your users a great mobile experience, they stay on your site longer and are more likely to do business with your company. Google has recently announced that websites with mobile friendly versions are given a "slight boost" in the search results. No one knows for sure how much of a benefit this translates to but every advantage helps in today's competitive Internet landscape. Some sites implement mobile friendly sites by providing a link on the full-screen site that allows the user to navigate to the mobile version of the site. The problem with this solution is that the user must find or notice the button to switch to the phone-friendly interface. A better approach is for your website to automatically detect the device that your visitor is using and render the page for optimal viewing. This way the user does not have to do anything special, they always get the version of the site that is best for them. Which Pages of the Site Should Be Mobile Friendly? 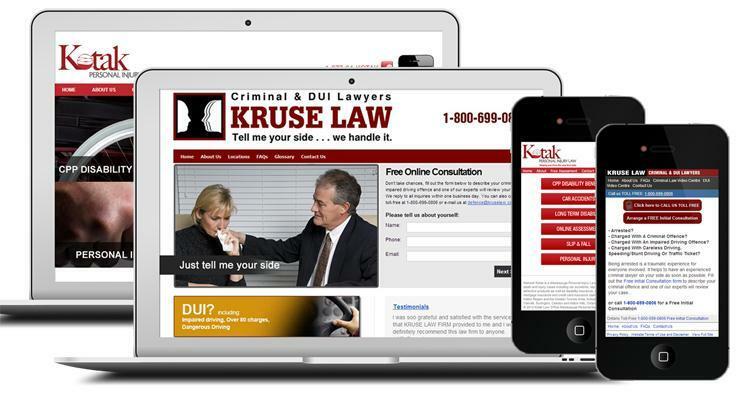 Some website owners don’t want to go to the trouble of creating mobile friendly versions of all of their site’s pages. Instead, they may only create smaller versions of the Home page and a few key inside pages. This is not a good strategy because most people find your site via Google and other search engines. Assuming you have a properly optimized site, Google will have indexed every page of your site. Therefore, a cell phone user who clicks on a link to your site from Google’s search results could land on any page of your site. For this reason, all pages should cater to smaller screens when shown on a mobile device. Since a mobile version of your site is so important, we feel that all sites should have a mobile or phone-friendly version. For this reason we don’t charge extra to implement a mobile version. Part of your annual maintenance fee covers the ongoing effort to make sure your site renders well on all the latest technology and when we add new pages to the full-screen version of your site we also implement mobile-friendly versions of these pages. A mobile-friendly site is becoming essential to ensuring that you are communicating effectively with your customers while they are on the move. Having a great mobile-friendly site becomes an integral component in your company’s image since it demonstrates that you are keeping up with the latest technology. If your site is not designed for mobile use you are likely missing out on opportunities. Let We Think Solutions build a professional, phone friendly site for you today. A successful Web marketing campaign starts with a professionally designed website. Our websites are strategically planned to avoid all of the common business website problems that plague a majority of websites. Our expertise in this area is the cornerstone of our business. Our team has developed effective, sustainable techniques to increase your website's relevance to the major search engines. There are dozens of Search Engine Optimization techniques that all contribute, incrementally, to raising the position of your site within the search engines. If your website cannot be found in Google, your Web Marketing strategy will never achieve success. PPC (Pay-Per-Click) Advertising allows you to reach Internet users that SEO cannot reach. An effective Web Marketing strategy can also include advertising in Professional Directories and Conventional Marketing designed to send more traffic to your website.